But we’ve rarely cooked one that we’ve been moved to make again. Some versions look tempting enough with a topcoat of bubbly cheese and thick tomato gravy, but cutting out a square of it invariably reveals trouble at the core. Often placed between the pasta sheets raw, the zucchini and squash turn out steamy and limp, flooding the dish with their juices_or, in some instances, undercooked and crunchy. 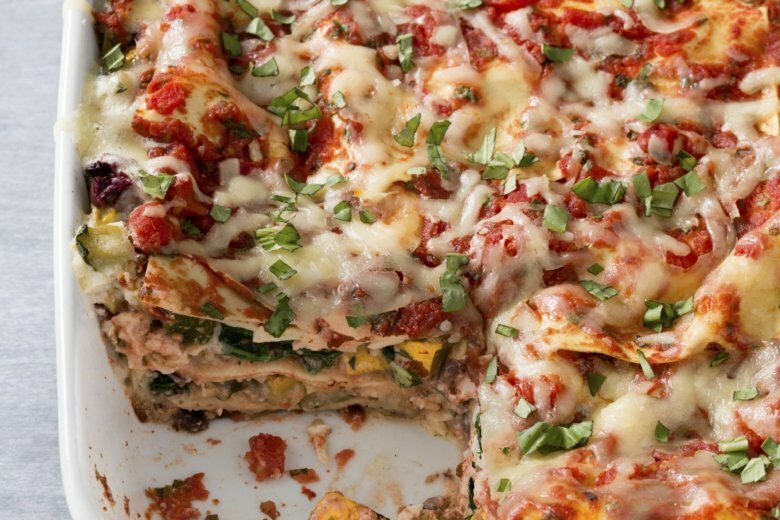 So what would it take to make a full-flavored lasagna with vegetables that could stand up to_not wash out_the cheese and sauce? Ridding the produce of some of its moisture and boosting its flavor before adding it to the dish would be steps in the right direction. Part-skim mozzarella can also be used in this recipe, but avoid pre-shredded cheese, as it does not melt well. We prefer kosher salt because it clings best to the eggplant. If using table salt, reduce the amounts by half. For the tomato sauce: Whisk all ingredients together in bowl; set aside. For the cream sauce: Whisk all ingredients together in second bowl; set aside. For the filling and noodles: Adjust oven rack to middle position and heat oven to 375 F. Toss eggplant with 1 teaspoon salt in large bowl. Line large plate with double layer of coffee filters and lightly spray with vegetable oil spray. Spread eggplant in even layer over coffee filters; wipe out and reserve bowl. Microwave eggplant until dry to touch and slightly shriveled, about 10 minutes, tossing halfway through microwaving. Let cool slightly. Return eggplant to bowl and toss with zucchini and summer squash. Combine 1 tablespoon oil, garlic, and thyme in small bowl. Heat 2 tablespoons oil in 12-inch nonstick skillet over medium-high heat until shimmering. Add half of eggplant mixture, 1/4 teaspoon salt, and 1/4 teaspoon pepper and cook, stirring occasionally, until vegetables are lightly browned, about 7 minutes. Push vegetables to sides of skillet. Add half of garlic mixture to center and cook, mashing mixture into pan, until fragrant, about 30 seconds. Stir garlic mixture into vegetables and transfer to medium bowl. Repeat with 2 tablespoons oil, remaining eggplant mixture, and remaining garlic mixture; transfer to bowl. Grease 13-by-9-inch baking dish. Spread 1 cup tomato sauce evenly over bottom of dish. Arrange 4 noodles on top of sauce (noodles will overlap). Spread half of vegetable mixture evenly over noodles, followed by 1/4 cup olives. Spoon half of cream sauce over top and sprinkle with 1 cup mozzarella. Repeat layering with 4 noodles, 1 cup tomato sauce, remaining vegetable mixture, remaining 1/4 cup olives, remaining cream sauce, and 1 cup mozzarella. For final layer, arrange remaining 4 noodles on top and cover completely with remaining tomato sauce. Sprinkle remaining 1 cup mozzarella evenly over tomato sauce. Cover dish tightly with aluminum foil that has been sprayed with oil spray and bake until edges are just bubbling, about 35 minutes, rotating dish halfway through baking. Let lasagna cool for 25 minutes, sprinkle with basil, and serve. Nutrition information per serving: 537 calories; 296 calories from fat; 33 g fat (14 g saturated; 0 g trans fats); 68 mg cholesterol; 928 mg sodium; 42 g carbohydrate; 6 g fiber; 9 g sugar; 25 g protein.